Generalmusic chose Musikmesse Frankfurt 2006 to launch the GPS1600, its new GEM Style Piano housed in an elegant baby grand cabinet. 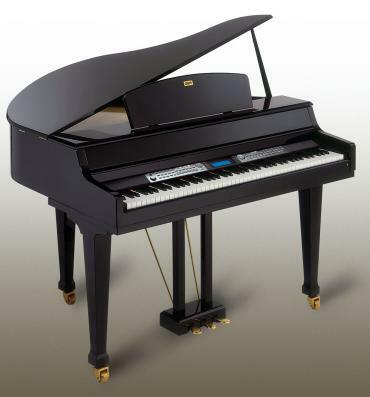 Based on the PS 1600 digital piano, the GPS model comes in an elegant high gloss Ebony finish with sliding key cover. The 88 note fully weighted hammer action keyboard with three touch settings provides expressive control not only over the Grand Piano tone, but also over the many other orchestral voices. Based on the styles of the top of the line Genesys Ensemble, the GPS1600's built in library comprises 100 musical styles, each with an individual Intro, End and a Variation. Five tracks (Drums, Bass, Acc.1, Acc.2, Acc.3) provide a musically advanced accompaniment controlled either by a chord or a single finger played in the bass register. A floppy disk drive provides playback of MIDI files with 64-note polyphony, 16 multi-timbral MIDI channels, and General MIDI. Users can store their perfomances to floppy disk. Direct from disk playback ensures fast operation. The control panel is designed for easy access. The large backlit display provides a clear visual guide to the instrument's advanced features and editing functions. For educational benefits, melody and bass lines are displayed in real time. © 1997 © 2006 Pro-Music-News™. All rights reserved. Thank you for visiting Pro-Music-News™.